The designations 'developed' and 'developing' economies are intended for statistical convenience and do not necessarily express a judgement about the stage reached by a particular country, territory or area in the development process. All rights reserved. No part of this book may be reproduced, stored in a retrieval system, or transmitted, in any form or by any means, electronic, mechanical, photocopying, recording, scanning or otherwise, except under the terms of the Copyright, Designs and Patents Act 1988 or under the terms of a licence issued by the Copyright Licensing Agency, 90 Tottenham Court Road, London W1P 9HE, UK, without the permission in writing of the Publisher and the copyright owner. This book reports on the results of experiments to assess the effects of global climate change on the agricultural production of crops and livestock. It covers issues such as the CO2 fertilization effect, the adverse effects of elevated levels of UV-B radiation and ozone on plant growth and productivity, and livestock. Combined effects are also studied, including changing CO2, temperature, and UV-B radiation and O3 simultaneously on crop growth. The concluding chapters give an idea of the overall global picture in terms of the effects already discussed. Changes in the world hydrological cycle, the regional availability of water resources, changes in soil conditions and the impact of this on food production, as well as modelling techniques, are all examined. 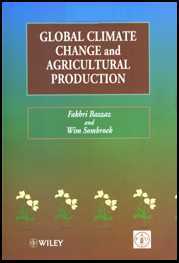 Global climate change and agricultural production: direct and indirect effects of changing hydrological soil and plant physiological processes/edited by Fakhri Bazzaz, Wim Sombroek. p. cm. This book is printed on acid-free paper responsibly manufactured from sustainable forestation, for which at least two trees are planted for each one used for paper production.